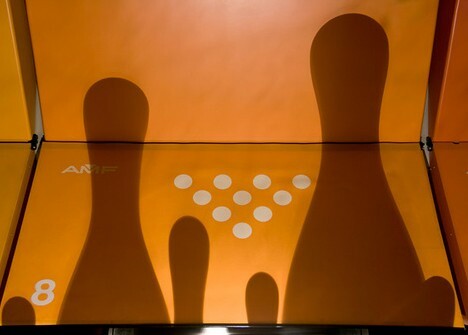 Bowling ain’t what it used to be, which was one of the most popular “family” activities around, all around the world. What happens when your local Bowlarama goes so quiet you can hear a pin drop? 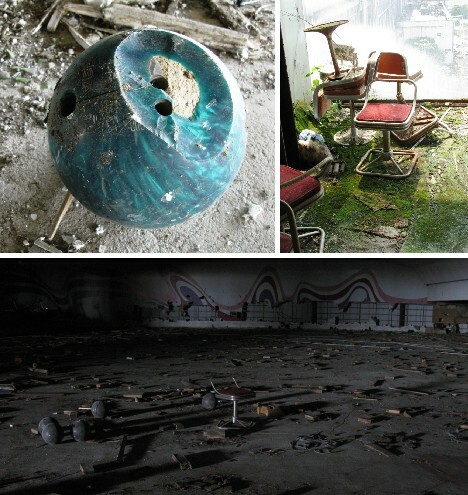 These 10 eerie abandoned bowling alleys have crossed the line from lustrous lanes of leisure to the gutters of despair. In 1980s Japan it seemed anything was possible – if you built it, they would come. Such was the case with the Kanagawa Toyo Bowl on the southern outskirts of Tokyo, which opened in 1987. A three-story colossus offering 108 lanes, an on-site pachinko parlor, a games arcade, restaurants and gift shops, the complex was the second-largest bowling emporium in the world. The keyword here is “was”. When Japan’s stock market and real estate bubbles burst in 1989, consumers slammed their wallets shut and after struggling on for a few years, so did the doors of the Kanagawa Toyo Bowl. 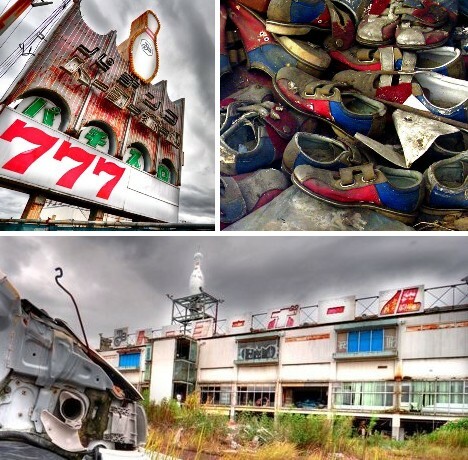 The building that housed the Kanagawa Toyo Bowl has remained vacant since the venture went bankrupt in 1999 and though the valuable wood has been stripped from the lanes, much else remains giving the site a strong post-apocalyptic atmosphere. 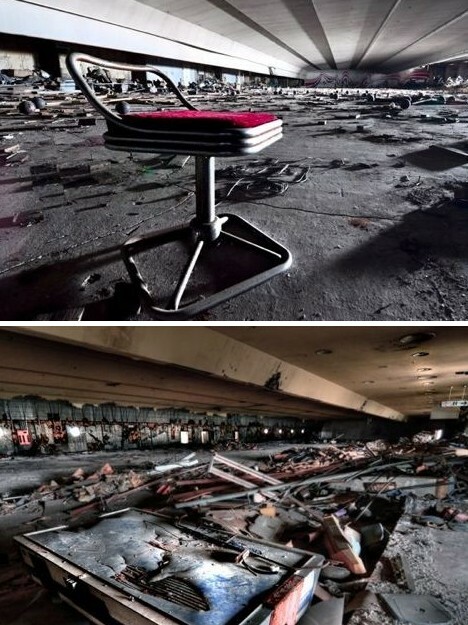 Cityeyesphoto, the photographer who took these photos, didn’t directly disclose the location of this decrepit bowling alley. 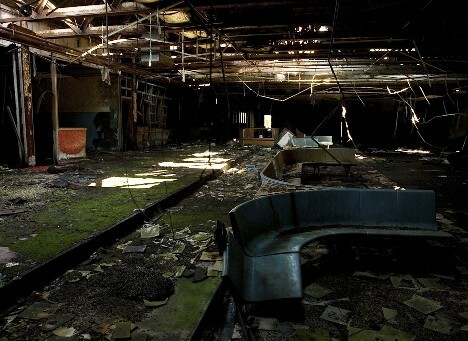 That’s not unusual as so-called “urban explorers” are often reluctant to disturb the natural process of decay that makes such sites so appealing. 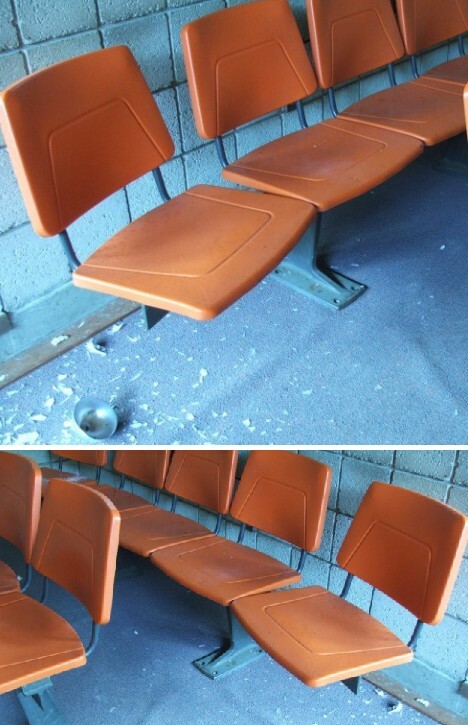 The moss growing on the plastic seats leads us to hazard a guess that this ex-bowlarama is slowly moldering away somewhere below the Mason-Dixon Line. Some small tags at the photog’s website, on the other hand, reveal the words “Gary” and “Indiana”. 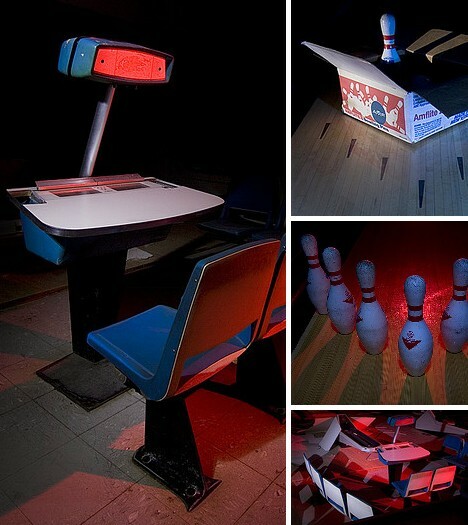 Not all abandoned bowling alleys are dim and desolate – a few aren’t dim at all, thanks to fortuitous lighting conditions and a little help from a strobelight-wielding photographer. Take the small, 6-lane bowling alley above. Once the source of much mirth and merriment on a now-shuttered military base, this cozy little alley closed around 1989. 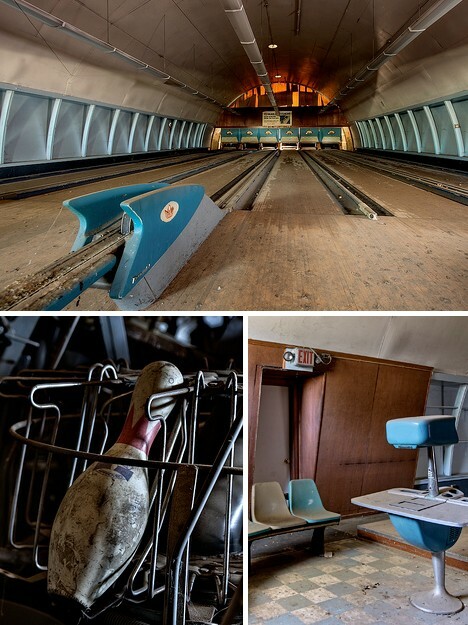 Surprisingly much of the original equipment, the wood on the lanes, even the EXIT signs are intact and much as the last bowler (or staff member) last saw them. Note the characteristic turquoise blue color scheme – obviously the fave hue of alley designers in the Golden Age of Bowling! Looks like this abandoned “Bo l g All y” could use a stint in rehab – conveniently, it’s located on the grounds of a rehab center. No telling if the center itself has been abandoned or just the bowling alley. One wonders what other amusements such centers provide to their clients, and as long as we’re wondering, how about a ten-pin, winner take all, bowl off between Lindsay Lohan and Britney Spears? Play-by-play provided by Nick Nolte and Mel Gibson, of course. 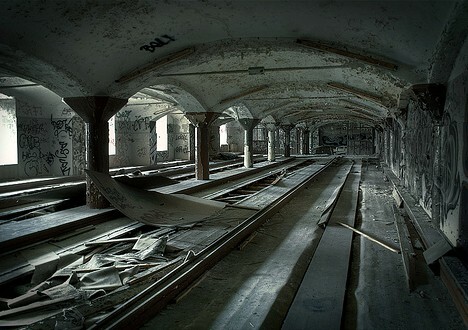 Berlin’s former Bömisches Brauhaus illustrates just how far an abandonment can fall before it’s completely unrecognizable. The 19th century brewery underwent conversion into a sports center that included facilities for basketball, football, and ten-pin bowling. Those days are long gone, however, and photographer extraordinaire Dennis Gerbeckx has accentuated their decrepit current state through the skillful exploitation of light and shadow. 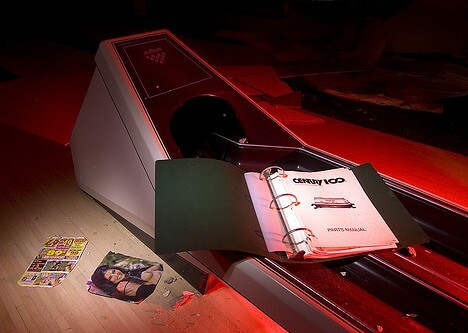 In Gerbeckx’ harsh and somber imagery one would be forgiven for thinking the last strike thrown at this bowling alley was an air strike. 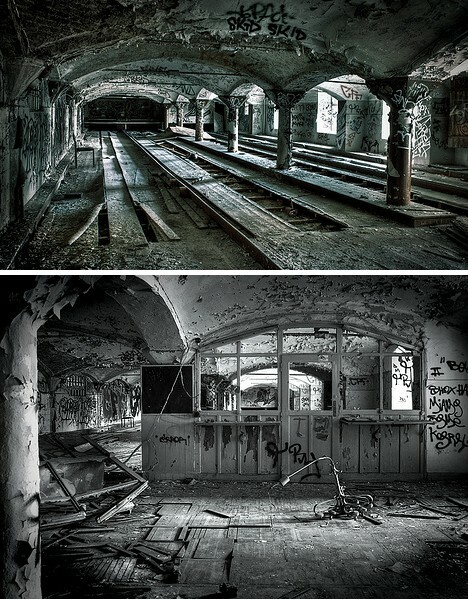 Keith Thorne has also featured the abandoned bowling alley at the Bömisches Brauhaus in his photos, but Thorne’s take on Berlin’s ruined “kegelbahn” is somewhat different than that of Dennis Gerbeckx. 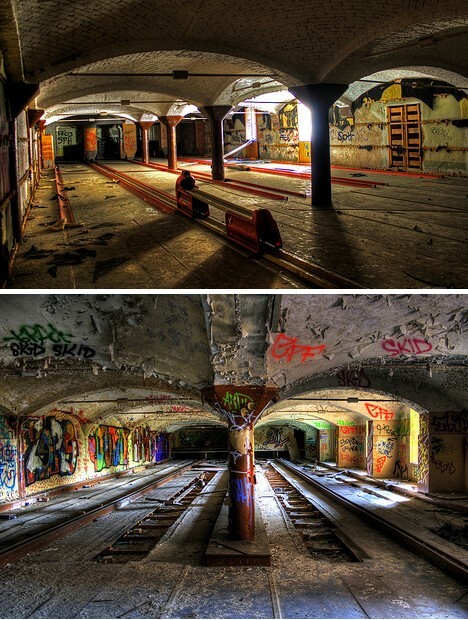 As can be seen above, Thorne plays up the bright, contrasting colors of the garish graffiti and provides contrast between the flaking concrete infrastructure and the warmth of the remaining wooden bowling machinery. 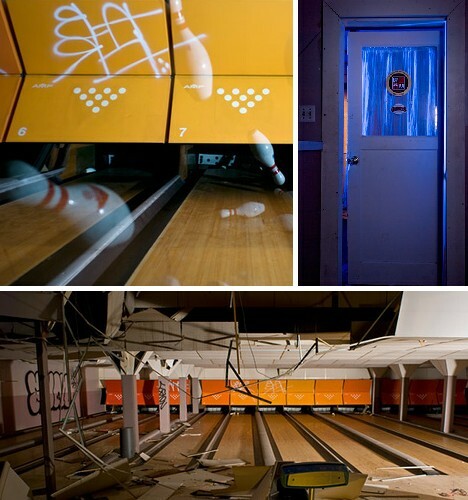 An abandoned bowling alley in the San Francisco area comes alive through some awesome lighting effects in these images taken in 2007 and 2008. 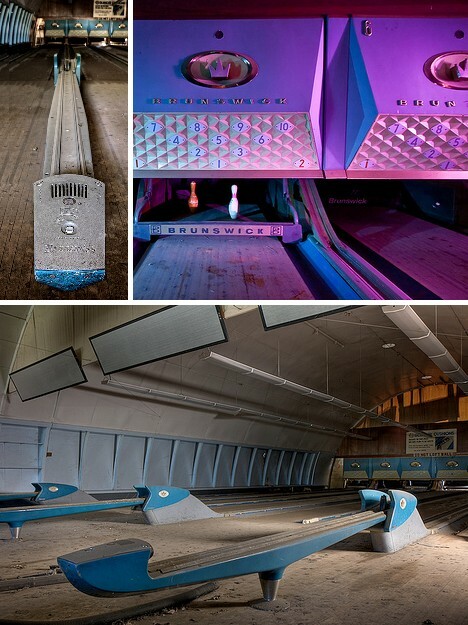 The exact location of this Big Lebowski-esque bowling alley is unknown, as photographer Lost America was sworn to secrecy lest vagrants and vandals disrupt the place’s unique, “frozen in time” vibe. Sadly, it seems this old alley was razed and a condo development now occupies its former site. Where once was heard the rolling thunder of ten-pin bowling balls and the ominous clicking of scattered pins on polished wood, now only the drab minutia of routine living lands softly on jaded ears. March of the Pin-guins? Only the Shadow – and photographer Scott Haefner knows for sure! The Inazawa Grand Bowl in Japan’s Aichi prefecture is the world’s largest, with 116 lanes. Maybe that’s why other bowling alleys in the Nagoya metro area aren’t doing so well. The abandoned alley above, judging from the groovy decor, dates back to the Summer of Love. 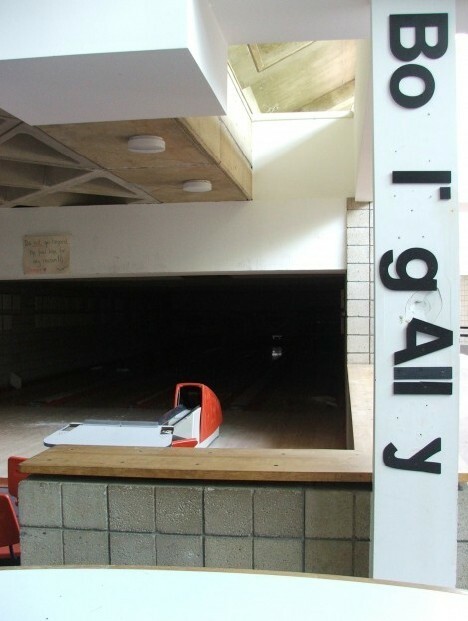 The alley’s exact name and location in Aichi prefecture aren’t mentioned by the photographers but the relative abundance of moss and other plant life indicates the Japanese pro bowler’s tour passed it by a long time ago. 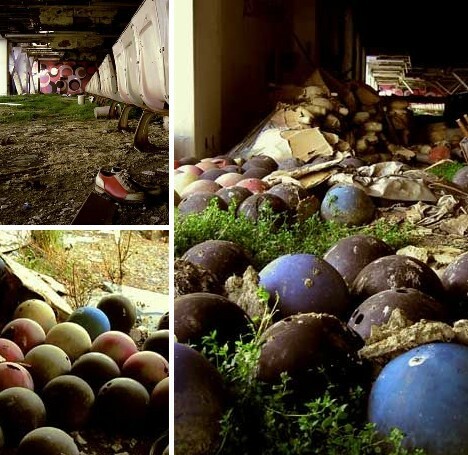 Abandoned bowling balls, or the nest of the Queen Alien? Anyone care to get close enough to find out for sure? Thought so – odd that this particular abandoned bowling alley is chock full of shoes, balls, pins and other assorted bowling accessories. You’d think they’d be worth something on the secondhand market but then again, if bowling’s really in a steep decline then the demand just wouldn’t be out there. 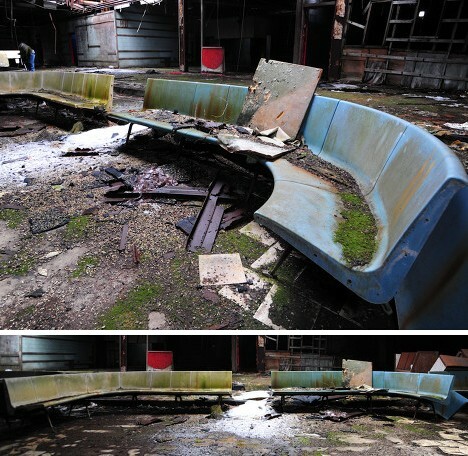 Here’s another abandoned bowling alley from Gary, Indiana, a town so ravaged by urban decay there’s at least one website chronicling it: Abandonedgary.com. Seems Gary hasn’t seen many strikes of late, unless you count the ones mounted in vain by Rust Belt industrial workers squeezed out of the city’s formerly thriving manufacturing base. Note the lovely shag carpet that – oh wait, that’s moss. Still, the contrast between the rich turquoise plastic seating and the bilious green moss that thrives in the dim, dank, damp interior of the alley does make for a classic post-apocalyptic tableau. 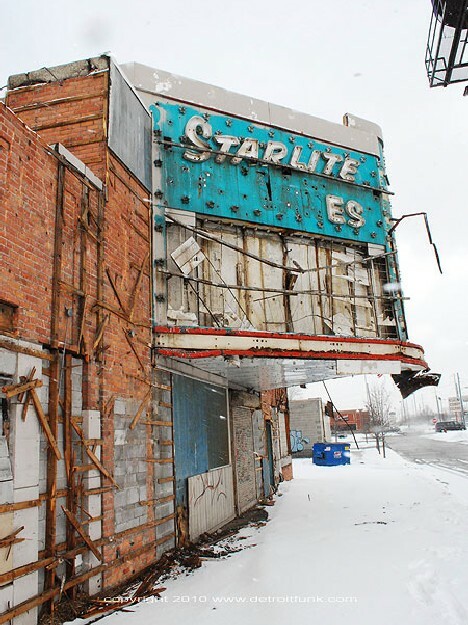 Formerly the Duke Theater (named for legendary jazz pianist and big band leader Duke Ellington), Starlite Lanes dates from the early 1950s. 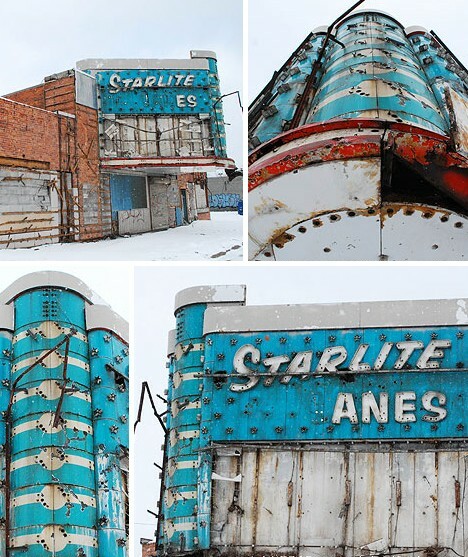 Just as the Duke lost out to the rising popularity of television, Starlite Lanes lost a long battle against more modern forms of entertainment. 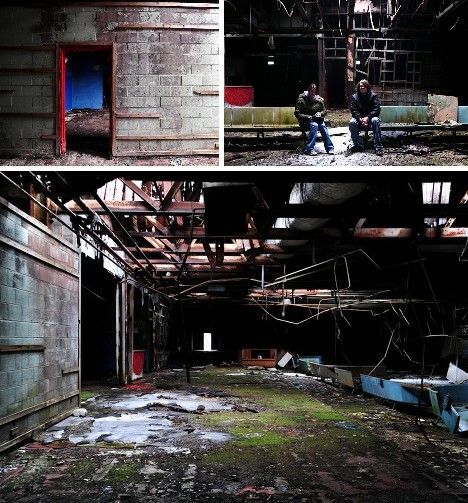 Its location in a dubious part of inner city Detroit probably hastened its demise. 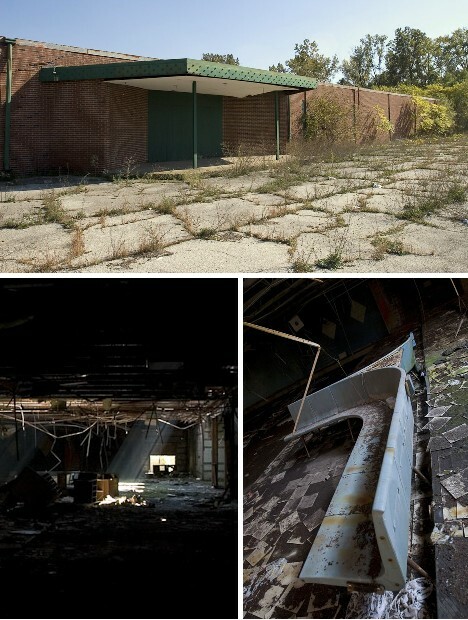 Adventurous souls can see the building up close & personal: drive out to Royal Oak Township, just across 8 Mile Road in north central Detroit – and keep your car doors locked. There’s that brilliant turquoise again. If any color defines the Fabulous Fifties, it’s this particular blue hue. Cars, kitchens, most any kind of plastic consumer goods and of course bowling alley seats all glowed with this classic Atom Age tint. 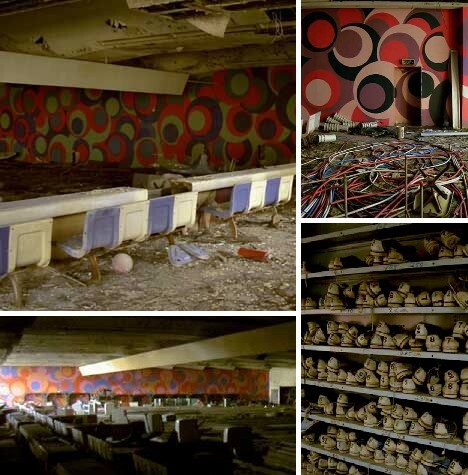 Documenting the decay of abandoned bowling alleys is cool, but upcycling them – or some parts thereof – is the bomb! 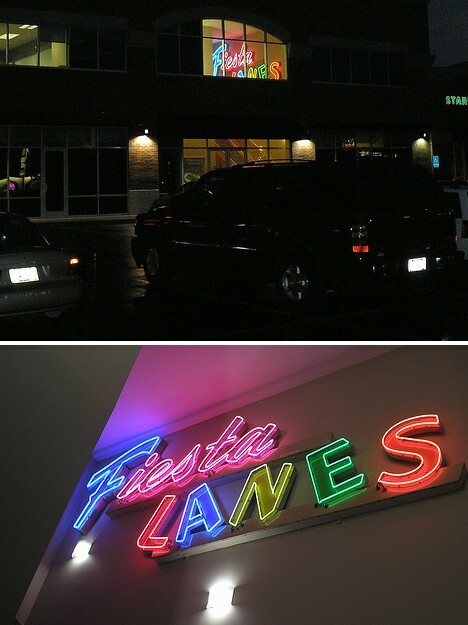 Take Fiesta Lanes, a popular bowlarama in Upper Arlington, Ohio, demolished in favor of a small two-story strip mall. 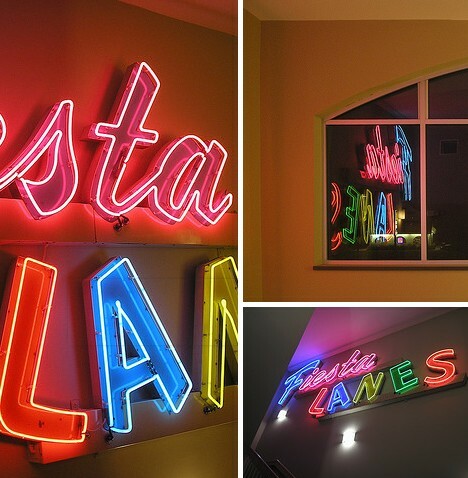 Though bowling balls succumbed to the wrecking ball, the gynecologist whose office now occupies the site must have harbored some fond memories of Fiesta Lanes… fond enough to have salvaged the alley’s iconic sign and install it in his hallway. Strikes, spares and speculums anyone? The sign’s candy colored neon letters shine a rainbow of light into the dark streets of this small Ohio college town, evoking a kinder, gentler time when an evening out at the bowling alley was, well, just swell. 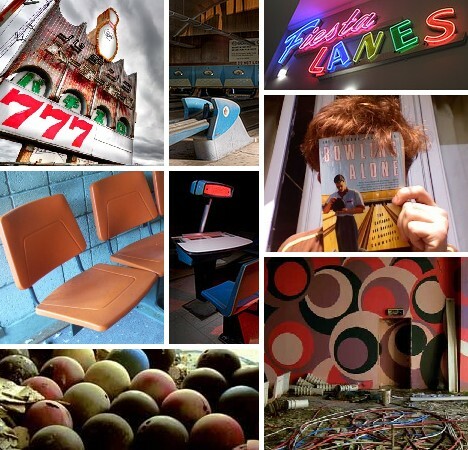 Robert D. Putnam used the rise and fall of bowling as a metaphor for the increasing dysfunction of social interaction in his 1995 essay “Bowling Alone: America’s Declining Social Capital.” Then there’s “Take The Skinheads Bowling”, a 1985 alternative music hit by Camper Van Beethoven, Bowling Green Kentucky, and of course bowling was the sport of choice for Fred Flintstone and Barney Rubble. 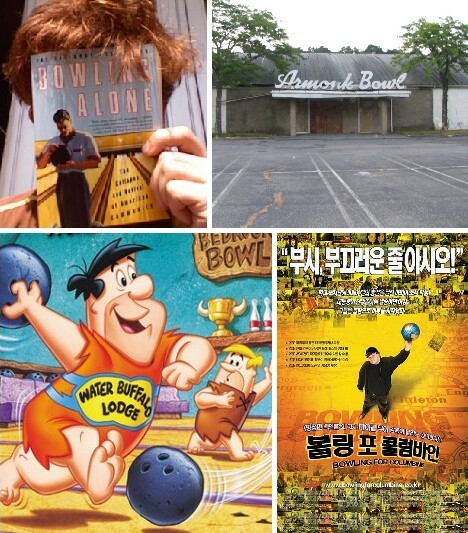 Cool or cheesy or both, bowling’s place in pop culture will endure even though so many bowling alleys have not.